Several weeks ago, doctors told Dustin Snyder he had weeks to live. So he turned to the person who had been beside him through it all - and he asked her to spend the rest of that time with him. Dustin Snyder knows that he may have only days left to live. 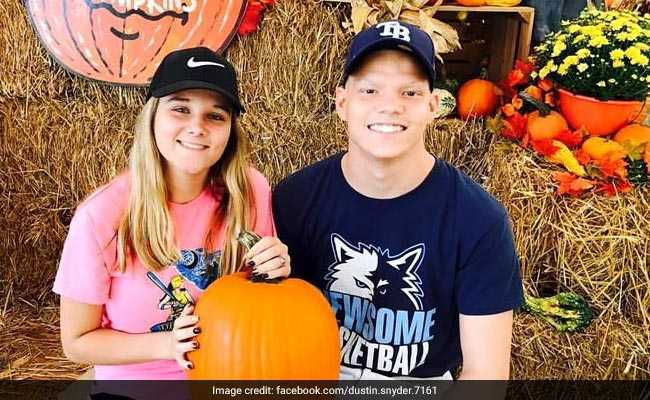 For the past year and a half, the 19-year-old has been battling a rare form of cancer called synovial sarcoma - undergoing treatments to remove the tumors and keep them from coming back, only to watch them return and ravage his body. Several weeks ago, doctors told him he had weeks to live. So he turned to the person who had been beside him through it all - and he asked her to spend the rest of that time with him. "I love her. She's been there for me through this whole process," Snyder said about his high school sweetheart, Sierra Siverio. Seeming to labor during a short phone interview Friday afternoon with The Washington Post, Snyder said that Siverio "means the world to me. I wouldn't be able to get through any of this without her." So, he said, he made it official - treating her to dinner Thursday night, presenting her with roses and popping that special question. Snyder asked her to marry him. Siverio, of course, said yes. "She's the woman I want to spend the rest of my life with," he said. 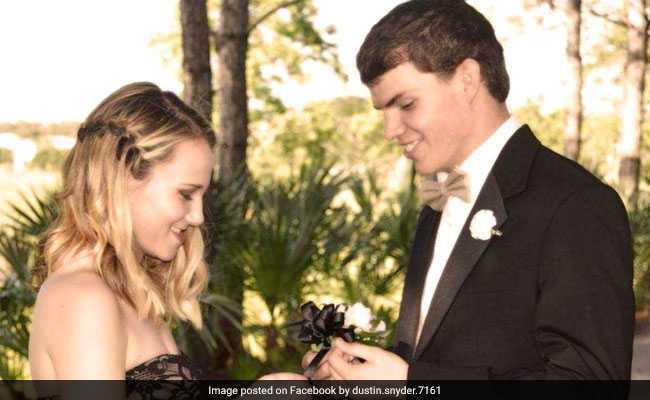 Snyder's mother, Cassandra Fondahn, said that earlier this week the couple privately discussed the idea of marriage - a moment that she hopes will make her son's last days memorable. He is currently at home, with regular visits from hospice and a pain-medication pump connected to his heart, she said. When word got out about the engagement, she said, Good Samaritans wanted to help - sending the bride-to-be wedding rings and a dress. A GoFundMe page created by his sister had raised close to $13,000 by Friday afternoon. "We are trying to make his wishes come true by providing him and his long-term girlfriend with a wedding on 28th Jan 2018 (Sunday)," the GoFundMe page says. "He really wants to marry the woman that has stuck by his side through all the sleepless night and now dealing with knowing he will pass any time soon. Dustin always said 'She is a Keeper.' Please lets help Dustin enjoy the rest of his life with his soulmate." Siverio could not immediately be reached for comment. She was out Friday afternoon shopping with her bridesmaids, Snyder's mother said. The couple plan to say "I do" on Sunday at the Big Red Barn, a farmers market with a private venue not far from their home in Valrico, Florida. It was a Monday in June 2016 - a day before his 18th birthday - when Snyder got the news. Doctors discovered the cancer in his left lung, which his mother said is rare. Synovial sarcoma is a slow-growing cancer that typically attacks the soft tissues near large joints and, in some cases, is initially misdiagnosed as arthritis or bursitis, according to the Mayo Clinic. Sometimes it can develop in the kidneys and lungs. "The goal is to remove the cancer and a margin of healthy tissue around it," according to the clinic. "This can sometimes mean the removal of an entire muscle or muscle group, or even amputation." Snyder's mother said he underwent chemotherapy and radiation "hoping to save the lung," but several months later doctors had to remove it. Following more chemo and more radiation, Snyder was cancer-free in January 2017, his mother said. Fondahn said that the prognosis was good, assuming her son's cancer did not return. But by August, she said, doctors had found three more spots. After that, Fondahn said, "we were told that it would keep coming back until they couldn't treat it anymore." More surgery. Then more good news - until about a month ago, when Fondahn said her son started to feel ill and lose weight. The cancer, she said, had taken over his stomach and pelvic area. "That's when they told us that this was the final deal," she said. "We weren't expecting it this fast," she added, "so it was very emotional, very hard to take. He's a very, very strong young man. He's a fighter, and he has this whole time been fighting through all of it." Fondahn said that several weeks ago, doctors told them Snyder had only weeks to live. "He's getting worse," she said Friday, explaining that his hospice team keeps having to increase his pain medications. "He's getting weaker and tireder." "He got a small burst of energy since this whole wedding thing came about," his mother added. "We're really hoping that Sunday gets pulled off for him." Snyder and Siverio have known each other since middle school and even "dated" for a time back then, Fondahn said with a chuckle. But the pair lost touch when Snyder was moved to a different school district. It wasn't until about two years ago that they found each other again - when Siverio spotted him working at a local Steak 'n Shake, Fondahn said. "Every minute of this, she has been by his side," Fondahn said. "As a mom, I want him to be happy during his final days - whatever that is that makes him happy," Fondahn said about the wedding. "I don't think this will change anything dramatically for either one of them; it's just going to make both of them happy. And that's what it's all about. "She's going to get the wedding of her dreams to the man she loves, and he's going to be at peace knowing he has his soul mate with him when he goes."